Urban LifeClass is a London UK based Not-for-Profit Breathwork & Coaching Programme led by David Parker, incorporating Codependency Recovery, Relationship Reviews and breaking addictive patterns – including thoughts. Thought is creative but ACTION has more power, which is why we focus on affirmative ACTIONS not just affirmations. We also don’t use fancy language or special clothes, come as you are and speak as you do, we find this more authentic. The Athens Team below are an eclectic bunch, inter-generational, highly creative, non-judgemental and as you can see we LOVE what we do. No team member gets paid, your monies goes toward 2020 when we expect the need for a larger venue and a bigger programme of events. In the meantime we give service to serve you, so you can serve yourself, learn to breathe more productively and maybe support us in growth if you like what we do and the progress you make. All sexualities and genders welcome. So escape from your mind into your body, feel lighter, clearer and breathe out stress with experiential Somatic Evolutionary Breathwork. Each Workshop is for 10 participants MAX, so personal attention can be given. The Workshop is in English with Greek translation if required. sign up for this adventure with just 20 Euros for a 4 hour Introduction to Breathwork. There is no sign ups or obligations to continue with anything after, we just ask that if you can’t make the workshop you booked or you can’t transfer your place to another – we hold the 20 Euros as a donation. Sunday October 1st. One Day Breathwork Seminar – London (Belgravia/Victoria) 11am-7pm . . Prosper. Manage. Grow. Your prosperity consciousness is not dependent on money; but your flow of money is dependent upon your prosperity consciousness. Are you living in the PROBLEM? Scarcity Consciousness is an element of Codependency, escalating into lower esteem, unhealthy choices, toxic relationships and NOT GOOD ENOUGH mindsets. It’s easy to see codependency only as an issue with personal human relationships, when in fact ALL Relationships are affected by fear based SCARCITY, SURVIVAL & FEAR . . . Your relationships with money, work, social interaction and expanding friendships are just as affected, so working on LOVING YOURSELF is a major gift. BREATHWORK offers you the perfect opportunity to resolve these issues. Led by Professional Breathworkers David Parker and Luisa Bradshaw. WELCOME if you are new to Personal Development, Groupwork or Breathwork. We don’t do special languages, New Age stuff or talking sticks. Other groups do those things so much better than us. We are just a bunch of creative people willing to change habits, addictions and depleting toxic relationships from our lives. If you are new, one of our team can contact you if you wish to answer questions. We don’t sell anything, or sign anyone up, we leave the choice up to you. You don’t need to be Creative, just willing to check out your life and how you can change the impact of all your relationships. 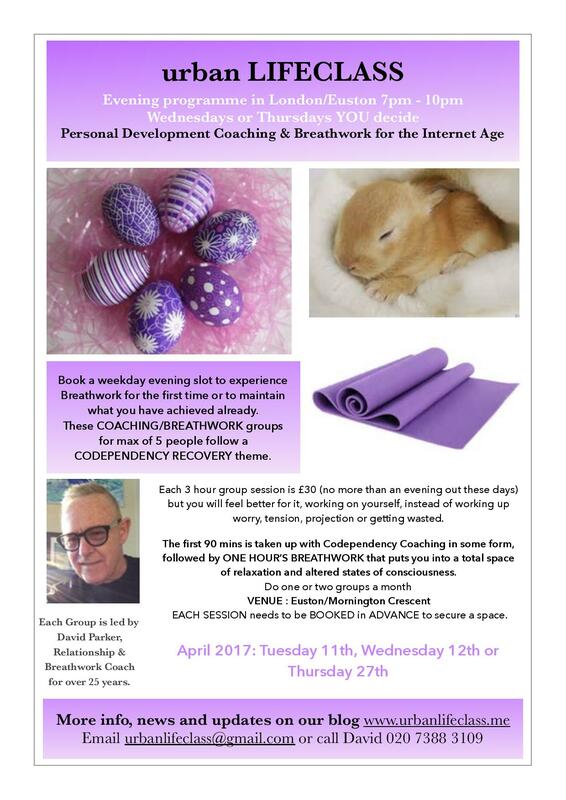 £70 for the whole day including a GROUP REBIRTH SESSION ( Some concessions are available for £50 if you are already on our list. Delayed/part payment will be individually considered. Paypal to codacoach@yahoo.co.uk BOOKING : Contact Robert Beck urbanlifeclass@gmail.com (+44) 7913862492 for payment options. Retail Therapy and Credit Card Concussion on a weekend is one way to feel good about yourself – however the temporary hit soon passes into oblivion past the changing room. Aint THAT the truth. Working on yourself and your Relationships is not as difficult as you think and far more value than a sudden fashion binge for a Saturday Night Out. In the end, peace of mind & inner security is a classic long-term fit – so STOP SHOPPING on Saturday Afternoon and JOIN US for FREE. Urban LIFECLASS focuses on Creative Relationship Rescue, ( not rescuing others, we must add ), but rescuing YOURSELF from codependency, lack of direction, family patterns, control issues and finding a voice that feels authentically strong. So we are travelling NORTH from London to explain about the power of BREATHWORK as a therapeutic tool, for those touching anxiety, depression and entrapment in some way, and how it can help. We invite all sexualities, cultures, ages and genders to Urban LIFECLASS Seminars, Retreats & Workshops, whichever city we work in. LGBTQI Welcome. Venue for FREE INTRO SATURDAY MARCH 11th 4-6pm & WEEKEND SEMINAR : Firmstart (Manchester) CIC, Birchvale Cl, St Wilfreds Enterprise Centre, Manchester M15 5BJ Saturday April 1st – Sunday April 2nd 2017 11am 7pm both days. Contact Suzanne 07960 465303 or email urbanlifeclass@gmail.com for more details on booking WEEKEND SEMINAR or to secure a FREE INTRO place on Saturday March 11th. Not this month because all 3 Evening Groups are FULL. Try JUNE. Urban LIFECLASS specialises in working with independent creatives, freelancers and Live Artists, as well as those who don’t perform, paint, design or dance, but they all learn that creativity is not always about performance, it’s about ideas, risk and ACTION. Many of our participants would know Robert Beck, our PA/Admin, through email or by attending our Breathwork Events, and would recognise Ted Rogers who assisted on our Maroc Retreat and participant on One Day Seminars, ( both 24 years old ) and Atabey (Carlos) Maria from Margate, attendee of our London Evening Breathwork Groups. ( Yes – he travels up every month from Kent to attend group). All 3 are prolific users and regular attendees, of Evolutionary BREATHWORK, the core practice of Urban LIFECLASS, and have turned IDEAS into ACTION. Written and directed by co-founder of Plain Paper Productions Robert Beck, and starring Tigger Blaize and Jon Hands, Prevail is a movement-led exploration of acceptance of the self. While in sunny MARGATE, KENT, Carlos & Ted, in conjunction with TATE’S Turner Contemporary Gallery have a created a unique combination of skills and ideas in a community based project for anyone over 50. READ ALL ABOUT IT BELOW. 50+ in KENT? . . WORK IT with these Boys! . . . STRIKE A POSE! Vogue-Chi mixes movement and lifestyle elements of both Vogueing – a dance style based on fashion poses – and Tai Chi to create a dynamic, self-affirming, meditative practice. Fully find new versions of yourself whilst exploring gender, unconventional beauty, and shameless self-indulgence in a loving and safe environment. VOGUE-CHI offers a gentle work out for the soul and a good ol’ stretch for the mind. This is what happens when you erase and BREATHE OUT fears with Breathwork, develop confidence and just BLOODY DO IT! !